My kitchen never stays clean for long. I’m just having immediate family over for Thanksgiving. Small informal affair. But I still had to go on a massive cleaning spree on Sunday to make the apartment guest worthy (a perk of living alone which comes back to bite you). Less than 24 hours later, my newly scrubbed down kitchen is again covered in flour and butter. Such is the way of things. I don’t know why I thought I was skilled enough at making biscuits to do it on the fly. I am not. However I am experienced enough to deal with super sticky dough and muscle through it to at least get an edible end product. Pretty to look at, no. Still very yummy, flakey and tender…yes. I made these buttermilk biscuits from Smitten Kitchen. I used three teaspoons of sugar and I used a powdered butter milk (3 tablespoons added to the dry ingredients, 3/4 cup of water added when it’s time to add the buttermilk at the end). My dough came out super moist and hard to handle. But I got through it (most likely overworking it a bit). I punched out my biscuits, threw two into the oven, and the rest onto a sheet to freeze up in the freezer. Those were for Thanksgiving. Not wanting to have turned on my oven for just two biscuits, I also toasted up some walnuts (also for Thanksgiving…planning ahead!) and made my dinner. In an 8×8 glass pan, I threw in a package of baby bella mushrooms (I bought a week ago, but never did anything with), along with two tablespoons of butter (1 tablespoon would have been enough), cubed and scattered among the mushrooms. I also drizzled in a little olive oil, a splash of balsamic vinegar and seasoned with kosher salt, pepper and french thyme (it’s what I had sitting by the stove at the moment). Into the oven it went. After maybe 20 minutes (or when the mushrooms looked a bit darker and softer), I pulled out the dish and added a couple of handfuls of kale, mixed it around and added some leftover shredded poached chicken. Yes, I am a weirdo who likes to poach a chicken on Sundays, shred up the meat and keep it in the fridge for quick weekday dinner additions like this. Back in the oven it went for another 5-10 minutes to heat up the chicken and crisp up the kale. Voila! A dinner (not including the biscuits) that required no measuring spoons and just throwing stuff into a dish and into an oven. Can’t get any simpler than that! 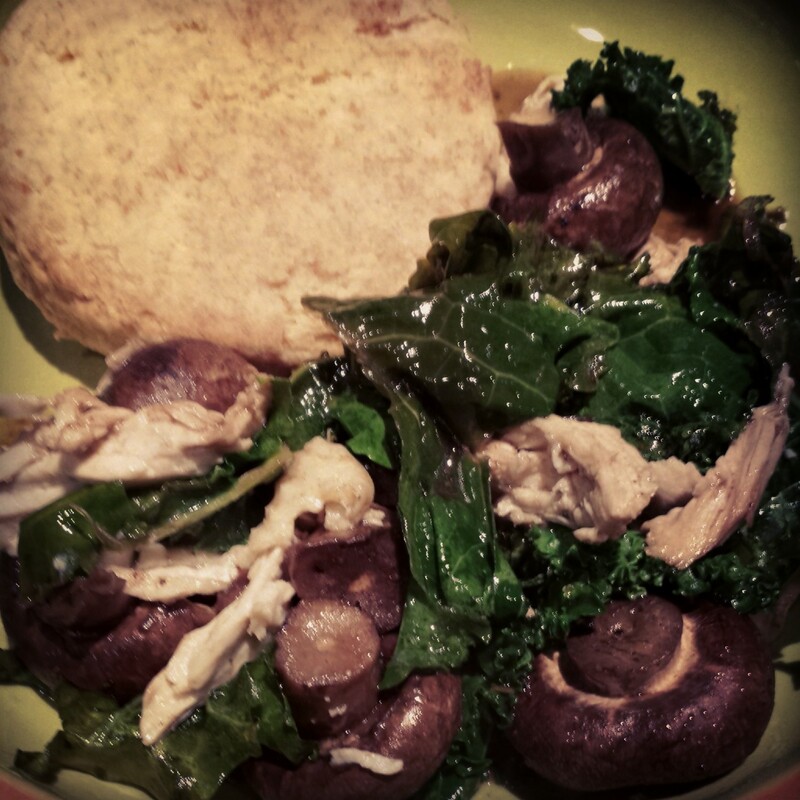 This entry was posted in Bread, Dinner, Uncategorized and tagged buttermilk biscuit, chicken, Kale, mushrooms, weeknight dinner. Bookmark the permalink.